Several things have been going on in the background in recent weeks. You might recall the problem I was having a while back with “Unwelcome Subscribers” to this blog. Happily the fix I implemented seems to have solved that problem, hopefully for good. Last week I took another step to help provide a bit more security to the site by adding something called Secure Sockets Layer (SSL for short). This is a standard security protocol for establishing encrypted links between a web server and a browser in an online communication. You will likely recognize this by the https prefix on the site web address. This changes the blog address (as well as the primary Louisiana Central website address) by adding that “s” to the http. If you use your old link to the site, you should be automatically re-directed to the new address. However I’d recommend that you update your link to the new one. I find that the new link will get you there a second or two faster. In my testing last week I think I got the bugs squashed, but if you happen to encounter something else, please let me know. In other news, the 7th annual Train Day at the Library event took place yesterday at the Jones Creek Library over in Baton Rouge. I had the privilege of assisting with the organization of the show this year, and we were rewarded with a record attendance. To be sure, nothing that I did caused that . . . I give all that credit to the absolutely gorgeous day we had, plus the reputation that the show has been building on for the six prior years. Though not aimed at hard-core railfans and model railroaders (the general public is the targeted audience), the show does draw in many of those folks, and that’s good because I think it has helped to entice more actual display participants to the event. The library has also been thrilled with the attendance, and continues to request the show each year. Hopefully, that will continue. Today marks the 6th anniversary of the start of construction of the Louisiana Central Railroad. As many of you know, the railroad suffered a horrific flood in August of 2016. I posted about it here in Flood! and had a short follow up in The Aftermath for new readers that may be unaware. Unfortunately little progress has been made with the restoration of the train room (which is actually a separate building from my home). After the immediate remediation of the building, it became a warehouse of sorts for things from the house, as well as a place to stage materials needed for reconstruction. My home restoration is essentially complete, with only minor details needing attention. Indeed, I’ve been back living here since last Thanksgiving. But moving back into the house didn’t mean it was complete, and it has taken much time to finish the restoration. Add to that time taken to “catch up” on things that were left undone for over a year! However, I’ve started making a wee bit of progress. The first step to the train building restoration is to simply empty it out, leaving only the layout structure itself in the building. I’ve got virtually all of the household stuff out, and I’ve started the process of packing the train room and shop equipment. But then the realization hit that I needed more space in my house (mainly the garage) to store the stuff from the train building. Ugh! So I’ve added more shelving in the garage, and am trying to get it cleared and organized so as to make the necessary space. But to be honest, the biggest hold up on getting this all done is simply burn out. Next month will see the second anniversary of that flood, and I’m just sick and tired of dealing with the aftermath. I’m not alone in that feeling, as I’ve got many people around me in that same boat. I would never have dreamed I’d still be dealing with flood related issues two years after the fact! But it will happen. The Louisiana Central is not forgotten or abandoned. I’m hoping the next anniversary will be one of joy and cheer. Wish me luck! Being pre-occupied with finishing up my home restoration (as a result of the great 2016 flood) coupled with a lack of progress on my model railroad, has resulted in very few posts over this past year. I’ve mentioned before that I have decided not to do any reconstruction in the train building until the house proper is complete. If I started the work out back, I would never finish the work still needed in the house (too much of a diversion). Drying out the place and remediation has been long completed . . . I just haven’t started the process of rebuilding. But I do hope to finally get out there sometime this winter to begin the work. In the meantime there are several activities, some railroad and one aviation oriented, that I hope to attend. I think it’s time for me to get out of the house more in order to keep my sanity! First up: The Greater Baton Rouge Model Railroaders up in Jackson, Louisiana will be holding their Trainfest on Saturday, October 14th. Things get rolling around 10 am. If you haven’t been to one of these open houses, you really should give it a shot. The club is home to quite a few operating layouts. 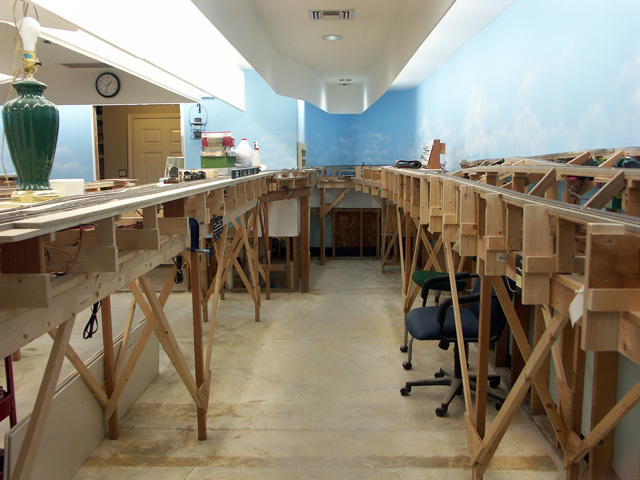 They cover all of the popular scales (Z, N, HO, S and O) with their indoor layouts. And there is an outdoor G scale layout, along with a separate live steam loop that sees trains running in various scales (G and Fn3 mostly). There is also an open pavilion that is used to shelter and restore a variety of full size equipment. I recently posted a couple photos from there including a neat little Plymouth critter, and a grape harvesting machine. There are quite a few other interesting pieces of machinery under and near the shelter. A week later (Saturday, August 21st) the Southeast Louisiana Chapter of the NRHS will be getting together for a day of railfanning over in Hammond, Louisiana. They will be meeting next to the Amtrak depot located downtown on the CN railroad mainline. Folks usually start gathering around 9 am or so, and you’re welcome to stay until you just can’t take it anymore. 🙂 Everyone is invited to join in, you don’t have to be a chapter member. The following week there will be an aviation event down in New Orleans. The WWII Air, Sea & Land Festival will be held at the Lakefront Airport on October 27-29. This is the fourth time this event has been there (it was given a new name this year), and it is an absolutely fabulous show. The primary forces behind the event are the Commemorative Air Force and the National WWII Museum in New Orleans. There will be a significant number of WWII aircraft both on display and flying, along with several ground vehicles ranging from jeeps to tanks. This year will also feature their newly restored PT boat. I don’t have details of exactly where the boat will be displayed, but I assume it will be in the adjacent harbor. Here’s another link if you’d like more information: The National WWII Museum. And finally, the Louisiana Chapter of the Train Collectors Association (TCA) will be holding their fall train show on Saturday, November 4th over in Ponchatoula, Louisiana. The event will be at the First Baptist Church gym located on E. Pine Street. Hours will be 9 am until 3 pm. This show coincides with the Ponchatoula Trade Days and Craft Fair which, while not railroad related, can be an interesting adjunct to the day. Whew, the next month will be busy! Hope to see some of you at one (or more) of these events. My, how time flies! Today marks the fifth anniversary of the Louisiana Central layout construction. Unfortunately tragedy struck the Louisiana Central less than a month after the fourth anniversary post was made. For those of you who are new to reading this blog, my city suffered a horrific flood last August 13th. 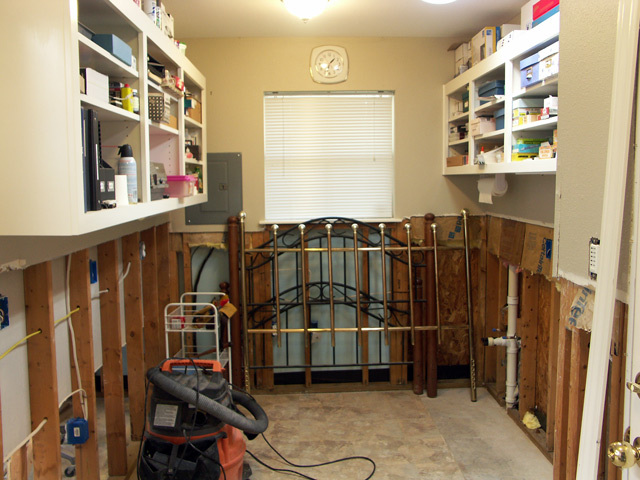 My home and the layout building took on about 15″ of flood waters. The good news is that the layout itself suffered only wet feet. However the restoration of the building (flooring, drywall, cabinets, etc.) is on hold until my house restoration is complete (hopefully within these next few weeks). Since the layout and building have been out of service for the past year (the building is serving as a warehouse for items salvaged from the house), there is little to report with regards to layout construction. A few weeks before the flood I posted my latest (and last) progress report on the layout, the advancement of the mainline west out of Oneida. The only mainline track left to be done is the last stretch into Monterey, and the track in the turnback curve back in the alcove (this is the mainline between Oneida and Whitcomb). I had just finished casting the bridge abutments needed there, and was about to cast the wing walls. The fourth anniversary installment gives more detail on the remaining work. I’ve spent time surveying the layout progress these past few months. I’ve laid enough trackage and done enough wiring now to have a good feel for the time required for those tasks. Once layout construction resumes, I should be able to completely finish laying track (including the yards and service areas) within two or three months. Add a month for the wiring, and another month or so to install all the fascia and control panels, and the layout will be ready for shakedown operations. Maybe I’ll have a big announcement on the sixth anniversary! Fortunately I was able to attend a half dozen railfan and model railroad events last winter and this spring. In just a few weeks (August 5th) the Southeastern Louisiana Chapter of the NRHS will be having their annual slide show at the Denham Springs library. It’s a lightly attended event, but I enjoy the company of those folks, and there are always some interesting slides to view. You don’t have to be a member to attend, so I encourage those of you local to this area to come join the fun. I’ll post my progress on the layout building restoration once it gets underway. Hopefully that will be soon. So, What’s Going On Now, Jack? 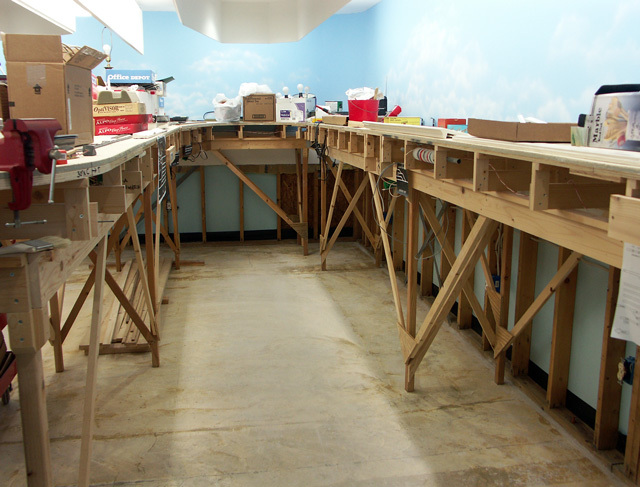 It seems like forever since the flooding of my home and train room last August. While both buildings have been dried out, cleaned and treated for mold, and prepped for construction, not much has happened in the reconstruction department. The problem has primarily been procuring the services of a reliable, local contractor. But the search has ended, and I should be starting that reconstruction process within a few weeks. I’ve started the ball rolling by insulating the house. I’ve nearly through with the living area, and will do the garage and storage room early next week. Then the new drywall can be hung, and that will be the first major step of many. Unfortunately, the train room recovery is on a back burner. It is in the same state as the house as far as remediation and preparation are concerned. However I’m using the train room as a warehouse for all the stuff that wouldn’t fit in the mini-warehouse (and that’s a lot of stuff). The plan is to move everything from the building into the house once the house is complete. Then I can start the rebuild process in the train room. I wish I could do things more quickly, but this is the best I’ll be able to do. But I have enjoyed some quality hobby time over the past few months by attending several events in the area, and by spending time with some of my railroading buddies. Back in late January I participated in the annual Train Day at the Library which is hosted by the Jones Creek Road branch of the public library of Baton Rouge. The displays at the show were a bit lighter this year due to the fact that several of the participating hosts of the event had themselves flooded and lost much or all of their valued equipment and/or collections. Particularly hard hit was Forrest Becht, the driving force behind the show. Forrest lost virtually all of his photo collection (and that’s quite a bit). But the show was still a hit, and we’ve already been invited back to do the show again next year. The following week I was off to visit friends at the annual banquet of the Mississippi Great Southern Chapter of the NRHS in Hattiesburg, Mississippi. As usual, the food was excellent, the presentation superb and the camaraderie was marvelous. This particular event has become my favorite each year and I’m already looking forward to next year’s get-together. Fast forward two more weeks and I attended the annual banquet of the Southeast Louisiana Chapter of the NRHS in Hammond, Louisiana. I have the same comment here as I had above. I have friends in this group some of which go back to the late 70s, and it’s always a pleasure visiting with them. And a recent surprise: Matt Hardy, one of the former operators of the late Lou Schultz’s layout, organized an event held this past Wednesday over in Covington, Louisiana. Several of us from the Baton Rouge area met with the Covington crowd at Lola’s Restaurant located in the former train depot in downtown Covington. While there, we toured an old Brill car that is just starting to undergo a cosmetic restoration. Afterward we retired to Matt’s home for an excellent presentation by David Price of Mississippi. David is a local historian of the shortline railroads and logging operations in Mississippi, and also many of those in Louisiana. I’ve enjoyed David’s presentations in the past and this was no exception. We then took a short tour of Matt’s layout (always interesting to see the progression of layouts over the years), and then we went over to Mike Walsdorf’s to see what was up at his L&N pike. Another great day! And it isn’t over yet. This weekend there will be a train show over in Ponchatoula, Louisiana, and near the end of this month the club up in Jackson, Louisiana will be hosting an open house at their huge facility. Those folks have at least four large indoor layouts (and I think a few small ones), and two G scale outdoor layouts, one of which is live steam. I always enjoy the show and camaraderie there as well. The one thing that has really come to light over the past months is how important my relationships with fellow railfans and modelers have become. The older I get, the more I cherish the time I spend with other like-minded folks. Just last month Don Hanley, the associate editor of Model Railroad Hobbyist magazine, did an editorial entitled Build Relationships as Well as Models. It was a timely piece and I agree with most all he espouses in the article. You can read it yourself (for free) in the February 2017 issue. Well, I hadn’t intended to pen such a lengthy rambling, but then I haven’t penned much of anything for months, so I had to catch up! Here’s to all my great railroading friends! It’s been over three months since my home and layout building flooded. Both have since been dried out and are waiting for reconstruction. The building inspector must certify the structures before the walls can be closed in. However the inspection department is grossly overloaded, and the inspector is nowhere in sight! It’s been several weeks since I received my building permit, but I’m dead in the water until the official shows up. I thought I’d post a few photos showing the “cleaned up” train room and shop. Fortunately, the layout itself has received no significant damage, as only the legs and bracing got wet. It has all been sprayed with a mold killing chemical to insure there won’t be a future problem there. Here’s the first view of the layout room. As you can see, the carpet, and the bottom 30″ of gypsum board and wall insulation have been removed and disposed of. Things are dried out pretty well now. I still have to pack away all of the stuff on top of the layout. In the minutes before the flood (yes, that’s all the time I had) I piled everything I could on top in an effort to (hopefully) minimize damage. This is a view from the diagonal corner of the room. Note the flood water silt still covering the black chair base. Many things from the house have since migrated to this resting place in order to clear the house for remediation, and will have to be packed up and put into storage before reconstruction commences in this building. The upper half of the shop is relatively unscathed. However, all of the base cabinets (and much of the contents) were ruined and have been thrown out. For the time being, I no longer have a workbench (though I wouldn’t be using it now anyhow). I don’t plan to spend much effort out here until the house itself is complete and I’ve moved back in. But eventually this building will recover, and I’ll be back at layout construction once again. The Louisiana Central Railroad has flooded! On Saturday, August 13th the region I live in suffered a horrific flood. My home (and railroad building) were not in a flood zone (well, at least not before that fateful day). However a flood of epic proportions swept thru the area and the house and railroad room found themselves with 15″ of water inside. The river carrying the water has a flood stage somewhere near an elevation of 29 feet. The maximum recorded water level for the area was 44 feet, and this was considered a 100 year event. My house and railroad building are on land with an elevation of 52 feet. Considering the height of the building slab, and the water depth within the buildings, I’m estimating that the water reached an elevation of near 54 feet. Preliminary estimates I’ve heard on the radio say this may be close to a 1000 year event. If only I had been born a century earlier or later! My first realization that something was awry was about 7:30 that morning. I was about to head out to meet some railroad buddies for our weekly Saturday breakfast, when I noticed that the backyard was almost covered in water. Looking out the front window, I saw the street was under water. I had never seen this in my 21 years in this house, so I immediately starting raising what I could. About 45 minutes later I saw water seeping in the back door, at which time I thought “I better get out of here!”. I pulled the truck out of the garage, but it was too late. I saw a car stalled in the street and the water was already over the door sills. I knew that the rural highway at the end of the street was several feet lower than my street, so knew I had waited too long. I put the truck back in the garage (the highest point on the lot), and waded out to the street. All my neighbors were doing the same thing; we were all caught off guard. Someone said that they heard on the radio that the sheriff’s office had air boats coming out to rescue people. After wading around the center of the road for a while, a couple small boats appeared. They were crewed by young folks and they were trying to rescue people. I scored a ride in an old bass boat and off we went. The water was at about 30″ in the street at this time. When the boat turned at the highway, we were shocked. The houses along the highway already had water from mid window to just under the eaves. I noticed something sticking out of the water and realized that it was the light bar on the top of the police car that my neighbor drives home at night. The car itself was completely submerged. All this water in under two hours! I returned to the homestead on Tuesday, the 16th. I have been working continuously each day trying to dry out everything. Those that have experienced flooding know what I’m talking about . . . cutting out the sheetrock, removing insulation, removing cabinets, etc., etc. The big enemy here is mold, and it sets in very rapidly. The railroad room is a mixed bag. The actual layout suffered no damage, just wet benchwork legs. I had managed to pick up tools and really important stuff and stacked things on top of the benchwork. I lost all the materials and less important things. Actually, I was quite lucky to get some important things up in both the house and the train building. But about the railroad: After I got back to my home, I had been extremely worried about mitigating damage in the train building, as the house had first priority. Late last week four of the fellows from the old C&O operating group in Covington stopped by to see if they could offer some help, Walter Rieger, Sam Urrate, Mike Walsdorf and Johnny Miranda. They cut out and removed all the carpeting in the train room . . . a major piece of work. Thanks guys! Then a few days later my cousins from Hammond came over. Debbie spent time packing my dishes and cookware so I could put them in storage, and Jim went out to the train building. When I checked on him hours later, he had cut out the sheetrock below the layout level and removed all the wet insulation. Another great piece of work complete! Thanks to my cousins. Finally, earlier this week Wayne Robichaux and I went out there and removed the cabinets in the shop and restroom, cut out the sheetrock in that area, and removed the insulation. The immediate remediation in the train room is done, and it’s now drying out. Wayne has been extremely helpful in my recovery. Hopefully in a few days I can spray down the house and train building with the mold killing stuff, then start with the reconstruction. I don’t have a feel for how long the process will take, as there will be a shortage of contractors due to the HUGE number of people that lost their homes. I feel that I’ll be lucky to get back into my home within 4-6 months. But the most important thing is that I’m still alive and well. The Lord was with me on that fateful day. It’s hard for me to believe that today marks the fourth anniversary of the Louisiana Central layout construction. No, it doesn’t seem as if I just started last year. But neither does it seem like four years! I’m pleased to report that significant progress was made over the past year. To be sure, I went into full retirement last winter, so now have more time to spend on the construction. But I’ve also been in better spirits, and as a result, have been a bit more productive with the work. If you’d like to follow along as I discuss the construction, you can click here to open a track plan in a new tab. All three of the intermediate towns along the line (Oneida, Whitcomb and Maynard) are complete (with reference to roadbed, track and wiring). The only thing preventing them from full operation is the pending installation of the control panels so that the Tortoise switch motors can be controlled. The entire Spencer Lumber Company railroad operation has been completed. This includes the mill complex at Oneida, and all the way out to the re-load point up in the woods at Camp 6. Again, only the control panels need completion for operations to begin. Indeed, the only Louisiana Central mainline trackage left to be laid is in the turn-back curve at the alcove, and about 30 feet of mainline west of Oneida, and in to Monterey. And that won’t be undone for long. I’m almost finished with the first 15 feet of roadbed out of Oneida and track should be going down on that next week. The hold up in the alcove is the small overpass bridge west of Whitcomb. The bridge itself is built, and I’ve started building the forms for the abutments and wing walls that I plan to cast in plaster. Once the bridge is installed, the mainline can proceed across, and around the curve in the alcove. As a side note, the only downside to filling up all these areas with track has been the diminishing areas of storage for all of my clutter! But that’s a good price to pay. The remaining un-laid trackwork is at each end of the layout. The yards at Willis and Monterey have to be constructed, and there is an industrial complex between those areas that must be done. And finally, there is the locomotive service area at Willis that must be installed. That will likely be the last trackwork to go in. Fortunately, the sub-roadbed for all of this trackwork is complete, and the track centers have been laid out. So it’s just a matter of putting down the track and installing the Tortoise switch motors. All of this trackage will be code 70, and I still have to modify about 25 more Shinohara switches for DCC compatibility. And there is one more major thing that must be built: the bridge across the doorway into the room! This bridge is a few feet east of Monterey, and until it’s built, Monterey is isolated from the world. It’s not going to be just a narrow bridge with a strip of track. It will be a long timber trestle crossing a small spillway. Plans call for a bridge section nearly four feet long by one foot in width. The trestle will span most of that length. I feel that at least a 12″ width is needed to suggest the land and water that the trestle must span. I haven’t decided yet whether this bridge is going to swing down or lift up, but am favoring the lift up. This will be done similar to the pop-up that I built over in Monterey, but on a larger scale. I can’t swing the bridge up vertically, as it would hit the valance. Hence, the entire span must lift about two feet so that one can walk under it. I think that I’ll probably tackle this project this year so that I can complete the mainline. Wish me luck! Any questions or comments about what I’ve done, or where I’m going? Shoot me your words . . . I’d love to hear ’em. I’ve decided to sell some of my Lenz equipment. I’m offering a command station/booster, a computer interface, and several throttles. All items are like new, clean, no scratches or dents, and are complete, and have the latest version 3.6 software. My layout is not operational yet; equipment has only been used for testing during construction. Manuals are included. If you’d like to take a look at what I’m offering, head over to my For Sale page on the main website. In my last post I had indicated my need to take a bit of a breather from layout construction. I think that was a good decision as my spirits are taking a lift with this time off. To be sure, my enthusiasm for the hobby hasn’t waned a bit, as most every day I find myself focused on something hobby related. One of the things I’ve been mulling for some time is a slightly different approach to the method I’ll be using to control the layout. I’m going to take something of a hybrid approach to this, hence my decision to sell off some of my Lenz equipment that won’t be needed in my new scheme of things. I spent a little time last night visiting the MidSouth Model Railroad Club over in Baton Rouge, and I enjoyed seeing their relatively complete layout in action. Getting around an operational layout helps to get the juices flowing again. I spec I’ll be back out in the train room pretty soon for some construction. I have to confess, I really haven’t felt much like working on the layout for a couple of weeks now. Sure, I’ve been heading out to the layout room most each day, but I really haven’t been very productive . . . mostly looking for “low hanging fruit” to work on. I reconditioned a bunch of old Tortoise switch motors. And I transferred a sound decoder and speaker from a “basket case” Bachmann modern 4-4-0 to another similar model I have that is running and intact. Another small project completed. And I spent a day checking out my newly repaired digital camera. But none of this was advancing the state of the layout itself. The last two weekends have featured back-to-back NRHS* Chapter banquets, one in Hattiesburg, Mississippi, and the other in Hammond, Louisiana. I attended both and thoroughly enjoyed every aspect of each day. The journeys were good, the meals were good, the presentations at both were excellent, and most importantly, I really enjoyed the company of fellow modelers, railfans and historians. Today was the Hammond event, and afterward Ron Findley and I headed over to the train depot to hopefully catch a few trains. Traffic was a bit slow, so we decided to just stroll down Cate Street (along the track) and I started photographing the wonderful old buildings along that street. I guess Ron and I really got caught up into it, as we ended up strolling to the end of the business district, then started down Thomas Street where we repeated our photographic endeavors. And then there was Oak Street, and finally, Church Street. I believe I ended up with several hundred images, and I totally enjoyed our little foray. We eventually found our way back to the depot, where I noticed that there was quite a bit a material staged along the tracks and maintenance-of-way area. There was a crane parked on a spur, and one of those neat (Difco?) side dump ballast cars. Lots of rail, ties, ballast, spikes, tie plates and more. I suspect that this was material left over from the recent trestle repairs down at the Bonnet Carre Spillway. For those of you who are unaware, the CN experienced a major fire there a couple weeks ago that took out an entire span of trestle between two concrete fire breaks. But back to my original confession above, I have been going “hot and heavy” on the layout construction for over a year now. You long time readers may remember I went through an intense period of burn-out during my second year of construction and got very little accomplished, relatively speaking, as a result. I even wrote a post about it, Side-Stepping Burn Out. When I returned to serious construction a few months later, I knew I would have to change my work habits to help avoid this problem in the future. In large part, I’ve done better because I will work on something -say, trackwork- for several weeks, then I’ll switch off to something else; benchwork, electrical work, workshop projects, just about anything to break up the repetition and boredom that sometimes occurs when building a relatively large layout (mostly single handedly). But the burn-out symptoms have been rearing their ugly head again for some time now. And I’ve simply backed off from what I’ve been doing. I’m feeling a bit better about things now, especially after these two great Saturdays, and I suspect in another week or so that I’ll be raring to get after it again. To be sure, I continually feel some guilt for letting this time pass without “real” production, but I’ve told myself that this is after all, a hobby. And if I’m not happy doing it, then it ain’t a hobby! So not to worry, the Louisiana Central will continue to see heavy construction, albeit with just a short delay. Hmmm, now I’ve got to figure out how I’m going to fit those neat city buildings in over at Willis. As I mentioned in the previous post, I have managed to get some work done on the layout. I’m a couple weeks behind where I’d like to be, but all-in-all, things are still moving along nicely. The Spencer logging operation received a bit of track, extending from the high line (along the wall), down to the mainline that will head back to the mill. Last weekend I cut out the next section of sub-roadbed that, when installed, will take the mainline past Whitcomb to the point where the Spencer line ducks beneath the Louisiana Central mainline (see the track plan). And speaking of the Louisiana Central, the sub-roadbed has been extended from Maynard westward to within about three feet of Whitcomb. The next section of sub-roadbed, which will carry the line up to the middle of Whitcomb, has been cut out and is waiting for installation. I’ve also started laying cork roadbed from Maynard out to near the end of the new sub-roadbed. Electrically, all of the bus wiring that was run a few weeks ago has been tied into the circuit breakers beneath Whitcomb. Now they are energized and ready for service. And the Tortoise motors serving the Spencer trackage have their wiring extended down to the control panel location at the (future) fascia. Finally, Wayne and I made a lumber run and then ripped enough joists, risers and fascia supports to carry us through Whitcomb and Oneida (the next town down the line). We also cut several sections of Masonite fascia, and even managed to cut some long wooden tapers to use where track needs to drop from the cork roadbed down to the tabletop. I’d like to complete just a bit more work before posting any progress photos, but I think that will be soon. I’m optimistic about September and look forward to some solid progress during this month. The Spencer Lumber Company will play a significant role on the layout. Spencer will have a sawmill at Oneida (on the peninsula closest to the top of the track plan), and will have a railroad mainline running from the mill up to Camp 6 (a re-load point) in the woods east of Whitcomb. Camp 6 is physically located along the wall at the top of the track plan. The Louisiana Central mainline between Maynard and Whitcomb will also run along this section of benchwork, near the aisle. My construction protocol is to work from the wall out toward the aisle (a lesson learned the hard way). Therefore, I needed to build and install the Camp 6 roadbed and trackage before advancing the LC mainline from Maynard (where it presently ends) to Whitcomb. The sub-roadbed for Camp 6 has been in place since last September. However trackwork was never started only because I’d not tackled the task of modifying the Shinohara code 70 switches required for this area. As I mentioned in a recent post, the switch modification program has finally gotten under way, and work up at Camp 6 has resumed. The high line was designed to be removable for construction work. Two weekends ago I removed the right half and started laying track. This past weekend, the track was completed on this section, the Tortoise switch motors were installed, and all wiring was completed. I sprayed all the track with a coat of Rust-Oleum Camouflage Brown paint (first time I’ve done this), then re-installed the entire section of benchwork atop the risers. The left side benchwork has been removed and next weekend, similar work will ensue. As the final step, the double switchback will be constructed which will bring the trackage down to roughly the level of the (future) LC mainline. Once all this happens, both the Spencer and Louisiana Central trackage can advance to Whitcomb, and then on to Oneida. This will be a major milestone for the layout. I am anxious to achieve this progress, and have an excellent start to making it happen. The trackage along the wall and the peninsula written about above will be powered by the 3rd of the three DCC booster districts. Booster districts 1 and 2 have already been completed. This past weekend I set about installing this final district. The Lenz booster feeds two DCC Specialties PSX circuit breakers, one each for the LC and the Spencer operation. All components have been installed and wired, and some of the Spencer track bus wiring has been strung. The only work remaining will be the LC track bus and the Spencer track bus onto the peninsula. This summer is turning into a fairly productive one. I’m pleased with the progress being made on the layout thus far.